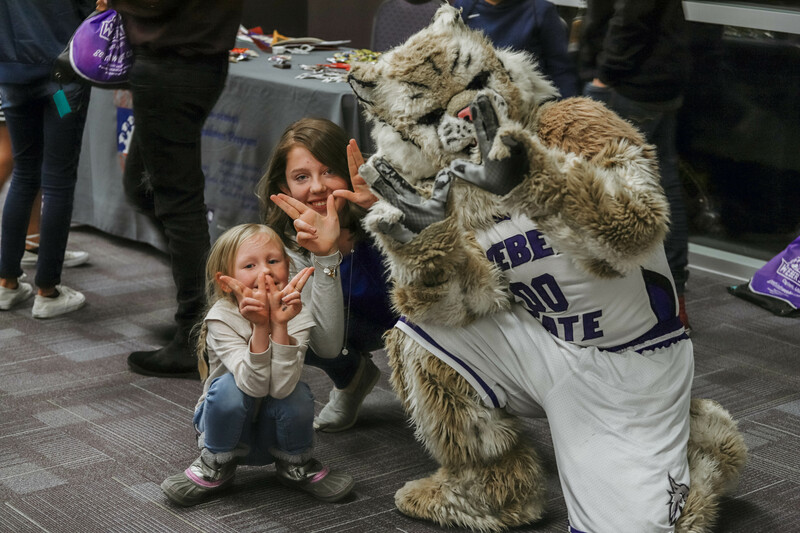 Parents, junior high and high school students came together to support students’ success towards higher education at WSU Davis for WSU’s GEAR UP Family Night on Jan. 15. 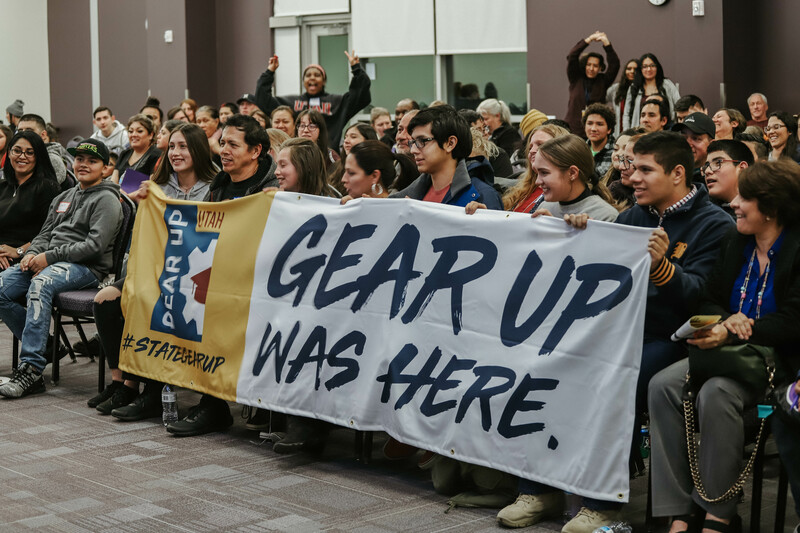 GEAR UP (Gaining Early Awareness and Readiness for Undergraduate Programs) is a federally funded college access and readiness program serving underprivileged, underserved and underrepresented students. GEAR UP focuses on ensuring students successfully graduate high school. When a college-going culture is established within their homes, students understand their post-secondary options and preparation to succeed within post-secondary education. Gear Up participants holding up their banner for a photo. Junior High and high schools from the Weber and Davis School District participate in WSU GEAR UP. Weber School District has an 87 percent high school graduation rate and Davis School District has a 95 percent graduation rate, according to the Utah State Board of Education. Students learned communication skills, time management, how to map out their future and the importance of scholarships during breakout workshops. Parents, separated by English and Spanish workshops, learned how to assist their students on their path to success and the impact higher education has on an individual’s future. Brandon Flores, director of WSU GEAR UP, said he views parents as students’ number one supporters, but sometimes parents do not know which tools are available to aid their children throughout the higher education process. “We want to get parents familiar with the tools and resources that are available to them. It’s just as important to us to educate the parents on how to navigate the system,” Flores said. 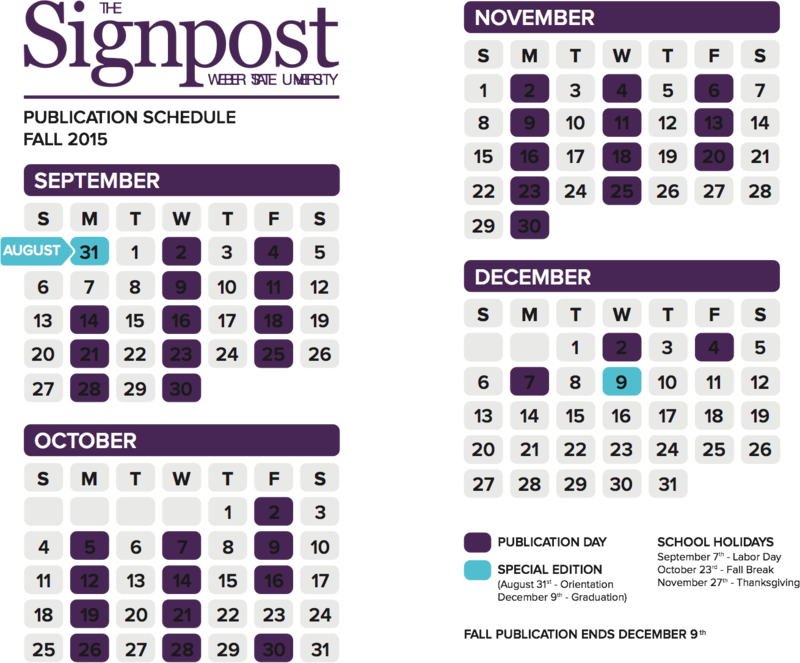 Besides family night, GEAR UP supports its students and parents by hosting college campus tours, tutoring, mentoring and assistance in understanding and obtaining financial aid and scholarships. GEAR UP helps students get acclimated during their freshman year of college. The program will get students who are not planning to attend WSU in touch with people in their chosen school. The goal is to assist the students within the high school to college transition. Students who will attend WSU go through a summer connections program that helps ease them into college life. It was Riley Miranda’s, a junior at NUAMES High School, first GEAR UP Family Night. She said the event can help sophomores and juniors in high school see how college works and understand things like FAFSA. Miranda plans to earn her associates at WSU. Waldo posing with Gear Up participants. Anwar Bermudez, senior at Bonneville High School, says his first option after high school is WSU. He said he would enjoy studying criminal justice, psychology, history or eventually becoming a professor at WSU. Megan Basler, senior at Bonneville High School, plans to attend WSU for her associates. Flores wants GEAR UP to feel like a community with students actively participating. Students from Bonneville, Syracuse and Ogden High School performed Mexican and Samoan dances to showcase their cultures.